About Us - Lake Argyle Swim Inc.
2011: 63 Swimmers, organised by the newly formed Lake Argyle Swim Inc. and Event Manager Taneille Anderson of Desert Wave Events. 2012: 117 Swimmers, organised by the Lake Argyle Swim Inc. and Taneille Anderson. 2013: 140 Swimmers, organisation going forward is by the Lake Argyle Swim Inc. and Event Manager:Glenn Taylor. 2014: 183 Swimmers, "sold-out"in 6 hours and winner of WA Event of the Year. 2015: 200 Swimmers, event "sold-out" in a record 3 hours. 2016: 249 Swimmers in 99 Teams, event "sells-out" in a record 2 hours. ​2017: 260 Swimmers in 113 Teams, 600 Adults at Gala Dinner. 2018: 314 Swimmers in 108 Teams, 650 Adults at Gala Dinner. Lake Argyle Swim announced winner of EVENT OF THE YEAR in the 2014 WA Sport and Recreation Industry Awards. Selected from more than 80 applications, the nominations showcased best practice and an exciting, diverse range of projects across WA’s thriving sport and recreation sector. It is an amazing honour for the First National Lake Argyle Swim was selected as the best event of the year form an incredible field of events. This is a fantastic boost to the region and our tourism sector. It is awesome that local athletes can be assured they have access to an event of world class quality on their door step. The award also provides our incredible sponsors and supporters the further recognition they deserve. 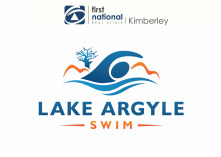 Thanks again for making the First National Kimberley Lake Argyle Swim Event of the Year. The Committee is delighted to have such loyal and generous support.